Book Review: 'Comics Will Break Your Heart,' By Faith Erin Hicks Faith Erin Hick's sweet new YA novel is reminiscent of the real-life conflict between Batman co-creators Bob Kane and Bill Finger — and asks what happens when the next generation meets up. The comics nerds among us may recognize the title of Faith Erin Hicks's latest book as a quote attributed to legendary King of Comics Jack Kirby: "Kid, comics will break your heart." The quote has been widely debated over the years, given Kirby's typical optimism about the medium — was he, maybe, referencing the working conditions in publishing at the time, and not the actual comics themselves? The comics industry is, was, and always will be ... a bit complicated. Just like Mir and Weldon's relationship. Miriam "Mir" Kendrick lives in Sandford, a small town in Nova Scotia. She works at a comic shop called Emporium of Wonders. She also happens to be the granddaughter of artist Micah Kendrick, who created the TomorrowMen comics along with writer Joseph Warrick. In Hicks' version of the story, Micah died and his daughter settled out of court. The settlement allowed the Kendricks a comfortable, if frugal life. But Mir is not a fan of her simple dial-up-internet, non-cordless-phone, vegetable-garden-in-the-backyard existence. Darn those Warricks! Enter Weldon Warrick, troublemaking L.A. bad boy forced to lived with his aunt and uncle in Canada as a punishment. In the first chapter, Mir saves Weldon from a sound beating by some local thugs. Turns out, he deserved it — but that doesn't sway Mir from falling for the one boy on the planet she should Absolutely Not Date. I was a little surprised to find that the rest of Hicks's novel was not as action-packed as the opening scene. Instead, the book blossoms into a tale of two star-crossed teens who don't know how to get what they want, or if they're even sure about what they want in the first place. The story never stops being interesting, but it didn't stop me from putting it down a few times to go do other things. The big court battle has already happened, years before — we're seeing the aftermath. Moments between Mir and Weldon happen slowly and quietly, without pomp and circumstance, much like small-town Sandford itself. Nothing toxic or earth-shattering or life-threatening unfolds; I wasn't up until 2am trying to binge the last chapter. And really, there's nothing wrong with that — the slower pace does not stop this book from being an excellent story. 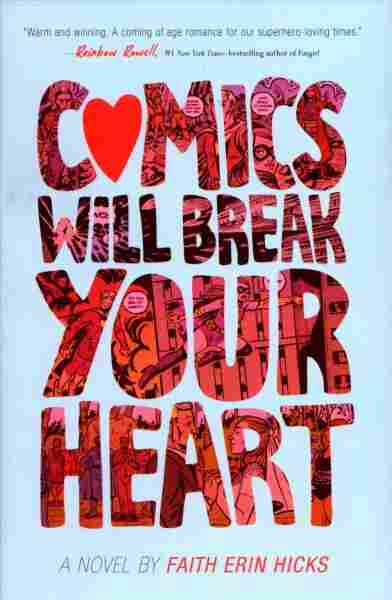 'Comics Will Break Your Heart' is a sweet book ... about how love and loneliness don't care how much money you have, and how actions have consequences. Teens will identify with Mir's internal struggle about going off to college. She's bright and has a million possibilities ahead of her, but not if she remains stuck in Sandford. Is she willing to leave her family and best friends to make that happen? And what is she doing with this boy she can't stop thinking about? Weldon, on the other hand, wants a functional family. He doesn't see the material things Mir lacks, he only sees that she has a mom and dad who live together, love each other, and want the best for her. He wants to be part of that so much that he lies to a lot of people to make it happen: his aunt and uncle, his father, and even Mir. Ultimately, Comics Will Break Your Heart is a sweet book about two young people falling for each other. It's about how love and loneliness don't care how much money you have, and how actions have consequences. It will leave you with a smile and warm fuzzies in your chest. And, I promise, it will not break your heart. Alethea Kontis is a voice actress and award-winning author of over 20 books for children and teens.